This site provides excellent detail about the abbey, including some great pictures and the means of navigating your way around. Traveling south from Rome you can hardly be unaware of the Apennine mountain chain to your left: backbone of Italy. From Fiuggi we moved down south towards Sorrento, stopping off to see the famous Montecassino Abbey en-route. During World War II this building, perched high in the mountains, was a place of desperate carnage as opposing forces battled for control of this tremendous vantage point. Nearby are various military cemeteries standing as permanent witness to this. What nationality are you? Pick your cemetery! And as you climb the twisting, mountainous road up to the abbey, spare a thought to those who battled and died on these bitter slopes. The abbey itself was destroyed in the war but, thanks to detailed plans carefully filed away in the vaults of the Vatican, it was possible to rebuild it in its original form. Today it has an air of permanence that makes it difficult to believe it has not stood there for untroubled centuries. In reality, it stands guard over the numerous cemeteries that bear silent witness to its defence. And how pleasant to put this past behind you after you ascend the sloping, cobbled entrance passage and emerge in the grassy Entrance Cloister and see peace perfectly represented by the doves on the bird bath. From here you pass through to the stunning Cloister of Bramante. It (merely) bears this name, I understand, because its peaceful spaciousness reflects the style of this famous Renaissance Architect. (A touch misleading, perhaps?) To one end lie the dramatic steps leading up to the Basilica Cathedral itself. To the opposite end lie arches leading through to the spectacular cloister view across to the sea. (My picture looks back at all this from the top of the steps.) In the centre can be seen an octagonal well surrounded by Corinthian columns. Like the other cloisters within this abbey, there is an overwhelming sense of peace. (The numerous cloisters serve well to enhance the monks' cloistered existence!) This was also the last view my camera ever saw. It decided to fade away peacefully at this point, but I'm pleased to say this did not prevent me from extricating the film containing so many memorable images. 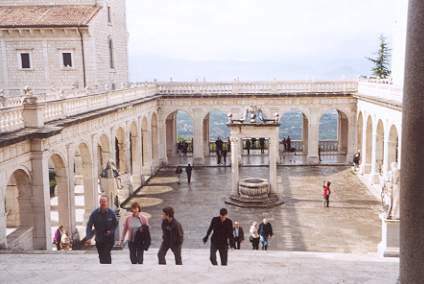 The Basilica itself was the most memorable of these at Montecassino. So elegant, so well-proportioned, so perfect. And while my camera failed to record this, the recommended Abbey's web site will depict this for you in all its glory. From the 'Plan of the Abbey' page you can visit anywhere you like. Don't miss this treat! It was a place I shall not easily forget. It had a museum and a shop, but it is simply its deep and reverent tranquility that I would recommend. Take the time out for that if you visit. And note how well monks do their housework! In the equivalent of a castle, with all the scope for stone dust, dirt dust, and visitor dust, a battalion of cleaners could hardly have achieved a better job at making it appear pristine: whether you are inside or outside its buildings. Once you have drunk from this cup of peace, make sure you're wide awake before the steep descent back down the mountain. And don't forget to pay your respects at the appropriate cemetery. There are plenty of road signs to assist you in this aim. You will have heard about the 'seagulls over Sorrento', of course. The trouble is, so have the locals: so they got out their little guns and popped them all. Regretfully, as in certain other European countries that shall be nameless on this page (if not on others), killing birds is apparently a great pastime here. And I'm not just talking seagulls, my friends. If you can spot any birds hereabouts they're probably in a cage. Such a pity! Not that I have any particular devotion to seagulls as such, you understand, but I do believe in the principle of allowing God's little creatures to live when they don't do you any harm. The presence of birds enhances a place so much. I wonder if the Montecassino doves realise how sensible it is to stay within the confines of the abbey? Monks, thankfully, only shoot prayers. You will have heard about the 'seagulls over Sorrento', of course. The trouble is, so have the locals: so they got out their little guns and popped them all. With this exception, I really did like my time spent in Sorrento. It was one of those places where you feel really safe: a great feeling these days. You can wander down back alleys without worry here. And you can see the true Italian way of life: young people behaving in way you wouldn't be ashamed of as a parent, even at night, and the family stroll of a Sunday evening. It is a place where the siesta is rigorously observed in all but a few cafés and bars. Tell me about it! 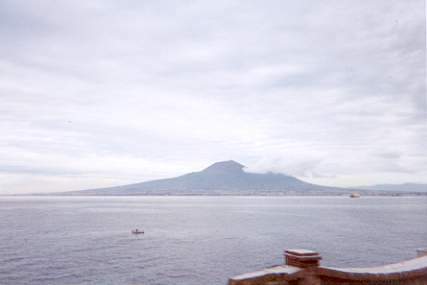 After checking in at our hotel with its beautiful balcony view over the Gulf of Naples towards the brooding mound of Vesuvius - doesn't that cloud hint at what the early stages of a distant, angry volcano might look like? - I immediately went to seek out a camera shop. (Your reporter felt very inadequate without a working camera. This picture was taken when I found a Fun-solution!) Reception kindly pointed through the hotel doors. Apparently there was an excellent photo shop opposite. But, they supposed, it would probably be closed for the siesta. They supposed right. So I returned to my room where H was suspiciously surveying the window blind. You know the kind: the ones that rattle up and down on the outside of the window to offer sun protection: and to ease you into a truly dark siesta. Our previous hotel had the same mechanism and, in my ignorance, I had struggled with that. How did you get it up? Forcing the bars upward merely causes them to spring down again towards vulnerable toes. After a while with my first encounter with these blinds, I did discover you pull on a camouflaged band nearby and this, with all the precision of an old pair of braces, could be used to wind the blind up. I had also learned that there was a release mechanism such that if you pulled the lower part of the band in a particular way, the blind would rattle back into its closed position. So I tried my newly-learned skills on this blind. It would not budge. So it took my countless years of DIY skills to eventually release the mechanism from what turned out to me a jammed condition. Then we were in business - until the next time is was wound up and jammed again! Next the TV. I do like the world news, best station of all and, generally, the only one in English. Roy Boy had already warned us that efforts to upgrade the hotel to a superbly luxurious condition had meant, for a few months past, that the TV would not work. But it would be good one day, he assured us. I was able to get it to work to some degree, and through regular snow, we were able to get some idea of what else was happening in the world. Then dinner. Amazing. Even in this hotel they had not discovered the vegetable! Now I am reliably informed that Italians think of little else but their next meal. That's what the siesta is for: to dream of the next meal. I am also reliably informed that you can get a wonderful selection of food in Italian hotels, so why is it that none of the ones we stayed in had discovered the vegetabl?. (Okay, I admit, I did spot the odd pea and tomato snipped in the Fiuggi hotel.) But of one thing I can assure you. There is no shortage of pasta in Italy. Great if you like it - and don't tire easily. Tough if you do! After the meal H and I wandered hopefully across to the photo shop. The shutters were still firmly down, yet siesta was clearly over. Back to reception. There was a very good watchmaker down the main street near the cathedral. The old man could fix anything. Perhaps he could fix my jammed winder mechanism. So off we set. Shop found. Shutter down. Next door chemist uncertain as to whether he would open because, shrug, he was old. So then we explored the night-time Sorrento, looping back and forth around what I later discovered they called the 'drains'. Now I would call them passages or lanes, but they call them drains. I hoped it did not rain in case the meaning clarified. The drains are the main attraction of Sorrento for me - with no unpleasant smell associated with them! The drains are the main attraction of Sorrento for me - with no unpleasant smell associated with them! Mainly because they were cobbled and cute. Picturesque, even. For these are the interesting, narrow little streets that are probably the main attraction for anyone who lives to shop. The crafts of the area are amply displayed, with wooden artifacts predominating. There is also an interesting shop producing original cameos and it was interesting to learn about these. I pass the information on so you know when you are being ripped of. A cameo is made from natural shell, which has a dark and a light layer- inside and outside, get it? - and the pattern is created by carving away one layer to reveal the other. So if you hold a true cameo up to the light the brown and white pattern is clear and there should be no sign of anything sticking layers together. Or blue. False cameos abound. They are generally blue. If you've paid a lot for one of these, you can feel blue! The main drain - sounds so salubrious, doesn't it? - runs parallel to the main street, a little below it on the sea side, and others cross it at right-angles, like the one shown in the picture which lines up beautifully with the tower of the cathedral. This is the drain in which you will find the cameo specialist. 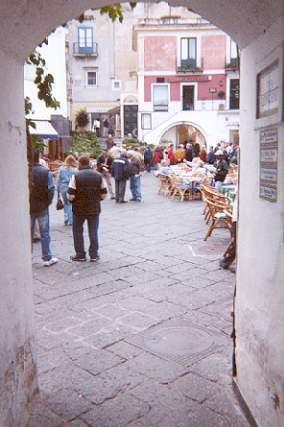 Sorrento offers countless places to eat and drink, in the drains, in the town square, everywhere. I was also able to purchase a Fun Camera: one of those 'use once and say farewell' jobs. The plan was to visit Pompeii the following day - an ambition I had taken a long while to achieve - and the risk of arriving there without a camera did not bear thinking about. Anyway, what would you think of me if I didn't offer pictures of that? So I bought a bog-ordinary Fun Camera plus a Flashing Fun Camera (or some such name). No expense spared for you, you see, my friends. At this stage, however, I did fondly regard these as emergency back-up, for I was determined to get my own camera working again. It was making this strange clicking noise when it should have been winding the film on. Sounded a bit untrustworthy, if you know what I mean. So once again we detoured past the old watchmaker's shop that first evening - siesta not broken - and then hopefully back to the wonderful photo shop opposite the hotel - siesta not broken - just my camera still! H and I took a carriage ride from the town square which was quite delightful. Slow progress around a part of the town we were not familiar with was most enjoyable, and our driver was very informative - and kind, for he even sported a rug beneath his straps to lesson the burden. (His horse was well looked-after as well.) It was from him we learned that it was not a good idea to pick and eat the fruit of the orange trees at the side of the street. Fine for marmalade, but a touch sharp for a snack, apparently. Talking of places to drink, you might care to try the local speciality: limoncello. All around these parts you will find lemon and orange groves and they have to do something with all that fruit. Since there's no great demand for' lemonlade' (have I got that right? ), they make a bright yellow drink known as limoncello from their lemons - and other best-kept-secret ingredients. The latter must be very necessary for rather than chilling this drink, you freeze it! I kid you not! The best way to enjoy this drink it to keep your bottle of it in your freezer, along with small shot-glasses, and then pour the frozen liquid into the frozen glasses and gulp-glug-freeze. Now I'm not saying that an essential ingredient is anti-freeze - yet how else would this work? - but I would say that given its potential for use as antifreeze, should it ever get that cold in Sorrento there will be no shortage of supply. Then even car radiators may radiate rude health! This drink is quite tasty when you get used to it. Granted, it might make your ignition falter a bit at first, but through regular practice, I am reliably informed by Roy Boy, you can learn to fire on all cylinders and get to really appreciate this local delicacy. Why not take a bottle home to knock the socks off your friends? (Just practice without socks at first.) In fact, I challenge you not to visit Sorrento without risking your socks on this. It's all part of the 'Sorrento experience' after all. 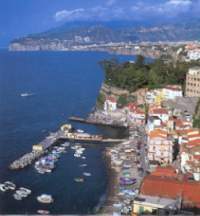 So far I have talked about what I call 'upper' Sorrento, but there is a 'lower', more original Sorrento, the place were this seagull-entrusted place first began: down by the old harbour. H was feeling groggy from that cold, so late one afternoon, with an hour or so free in our itinerary, I set off down steps and a steep and winding road to discover this area. There are two harbours known as Marina Grande and Marina Piccolo. When I finally emerged on the harbourside I was acutely aware of the fact that this was a different world - one of fishermen, boats, and old values - and it was clear that everyone there was expected to be known by everyone else. Frankly, I felt a bit of an intruder. So after taking special note of the lapping Gulf and admiring a great and moody sunset behind the broody, volcanic mound across the bay, I set off back to the upper town by way of steps. Lots of steps. Lots and lots of steps. They took me back into the centre of town. Funny how my return trip took me past a certain watchmaker's shop and a certain photo shop. And guess what. Yep. Who needs to set boundaries to a siesta? Why, I pleaded as I staggered back into reception, was the great photo shop opposite never open? The mostacciod receptionist did not know. It was quite unheard of. Unusual, even. Very good photo shop. The male receptionist didn't know why, either. I'm always up for a boat trip, so Capri sounded a good idea. And Roy Boy had an excellent guide lined up for us for this trip, a charming lady who managed to hold her own quite well against Roy's friendly banter. She also held a good umbrella. We traveled out on a hydrofoil - or some such contraption that took many people there quite fast, in a flurry of waves, diesel fumes and bluster. Walking in this vessel was challenging. Some gave up. 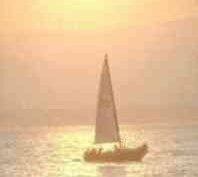 Not that it was rough, you understand, merely that the craft had a strong empathy for the sea. And it got there in little more than half-an-hour. 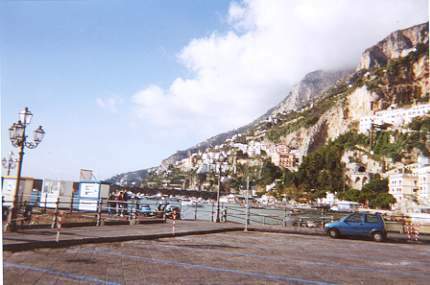 Capri's main square is sometimes called 'the drawing room of the world'. Here you may sit at a café table and watch the beautiful people stroll by. Now the Isle of Capri has the reputation for beautiful people, is appropriately expensive, and is even beautiful in itself. It also has a beautifully temperate climate all year round, this an added bonus to its natural, old-world, island charm. All this is accentuated by its quaint little byways. It's expensive here because they have to take a year's income in far fewer than 12 months. (It also helps to have a lot of rich people living or staying there, I guess.) One of its main claims to fame - at least to Brit's - is that it became the home of Gracie Fields, that war-time singer with a voice that, at times, was somewhat reminiscent of an air-raid siren. Not, of course, that I am old enough to remember an air-raid siren, but I have heard both and the comparison is worth noting. On the way up one of the twisting little roads, we passed the cemetery that contains the grave of 'Our Gracie' - you can actually see it from the road through a gate set in tall, stone walls - and, apparently, fresh flowers are placed on her grave every single day. A good contract, for sure. I am informed that a great friend of hers was the mother of Elton John and that the fresh-flower idea was hers. Dear Elton finances this, apparently, and I guess this will not make any great dent in his ever-expanding wallet: although such kindness is more difficult to find than florists to fulfil the wish. From the rear of this 'drawing room' is a narrow passageway (far too narrow for ordidnary transport) that leads to the Gardens of Ceasar Augustus, overlooking the sea and Fararaglione Rocks. En-route you will pass at least one of the most expensive hotels. The picture shows a wider part of this walk as you near the garden. 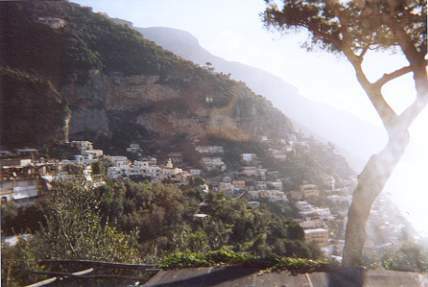 Later, you may care to take transport up to the much higher Anacapri, a village perched up the mountain, once only reached by an arduous flight of steps. How did anyone every live up there before they built the road? Can you imagine carrying up furniture? I am telling you, this way is endless. But if you are brave, of course, you might like to take this way down. While up an Anacapri you can even take a cable car ride to the top of the mountain. When I was there it was rather too cloudy so we gave it a miss in favour of walking to the little church that contains a fantastic mosaic floor depicting Adam and Eve. This is the size of the entire church - now a museum. So revered is the mosaic that you are required to circumnavigate its edges on a series of narrow, suspended planks. Don't panic if you have no head for heights, for they are only suspended about 15cm above the floor, but this system does mean that your progress is only as fast as the slowest visitor. But that's not a bad thing, for this floor deserves pondering - even teetering - upon. Walk the narrow path past the shop selling delicious limoncello (and/or orange) chocolate - don't miss this treat to savour - and you will eventually come to the top of the endless steps. 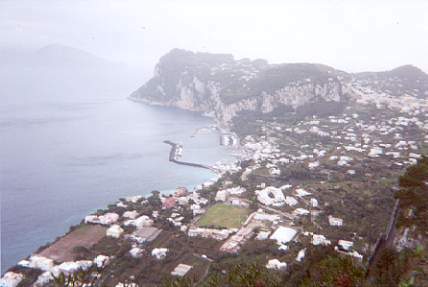 You can here enjoy the view of Capri below you, and congratulate yourself on not walking up. Although, of course, you might have found the bus trip up the mountain more scary than panting up the millions of steps, because it takes a certain kind of driver to drive buses along the narrow and winding roads of Capri - roads seldom wide enough for a bus to pass a car with ease, let alone another bus. Do you imagine this keeps their speed down? Come on! This is Italy! 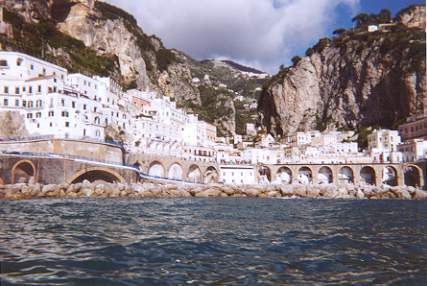 The Roman emperors, Augustus and Tiberius, both built villas on the Isle of Capri. Like moderns celebrities, they found its remoteness from the mainland gave them a safe haven. Tiberius built Villa Damecuta at Anacapri as his summer residence, but his grandest home there was Villa Jovis. The ruins of this huge villa on the north-east point of the island can be reached on foot from the town square. It originally comprised some 300 rooms occupying an area of over 7,000 square metres and included baths, gardens, terraces, avenues, ornamental fountains, pools, and immense cisterns to collect rainwater, then the only source of potable water on this island. While some might query some of the strange habits Tiberius had, and it is well documented that he could be very cruel, his military and political aptitudes were never in question. For virtually the last 10 years of his life (AD 27 - 37), he ruled over the immense Roman Empire from here. You will recall that, on my Rome page, I drew attention to the amazing abilities of roman emperors to control huge geographic areas: thanks to good roads! Yet today, a modern American President and an equally certain (and deluded) British Prime Minister, struggle to control a remote and poorly armed occupied country such as Iraq, despite their massively superior forces, firepower, aerial weapon and logistics support, plus modern communication systems employing everything from copper wire that cradles the globe, through radio, to satellites. To fully appreciate this, consider this fact. Tiberius achieved greater control for these 10 years, with little more than messengers and 'bush telegraph' - literally fire and smoke signal chains - his best communication with the political centre at Rome and his shore-based forces. It is enough to make a modern president blush. (But maybe that's not possible!) One of the methods Tiberius used to command a lot of personal respect was to torture his enemies on Capri and then force them to make the 300-metre leap over the cliff from Villa Jovis into the sea. Mostly they left without saying goodbye. Like I said, he was a forceful kind of chap. The trip back to the mainland was by ferry. Surprisingly this vessel, although large, had even more empathy for the sea which, by now, was heaving. (We had to leave an hour before the plan because this was the last ferry due to the sea condition.) It took a lot longer, but then it did travel much further: mainly in a vertical direction. It had a cavernous interior with passenger seats set a great distant apart from this area, large enough to dance in: although such a challenge would be altogether too difficult to achieve, given that merely crossing it proved difficult enough. A fellow passenger complained about how dirty the windows were before we set off. Why didn't the lazy whatnots ever wash it? Then we were at sea and it became plain that the lazy whatnots never needed to wash it. Although well above the plimsol line, the sea washed it very adequately on this trip, that was for certain. It was just a touch disconcerting that we often seemed to be looking up at the waves. Amalfi itself is a bustling little place in which, unlike Sorrento, traffic seems to take priority. So just crossing the street by the harbour or walking up the hilly main street is a hazardous occupation. There are back allies that are much safer, but apart from being quaint and extremely narrow, they offer little of interest. This said, it is not entirely true if you are in the know, for Roy Boy led us to a fantastic pizza parlour hidden away somewhere in a warren of passages. Clearly it was really aimed at the locals - no visitor could ever find it - and clearly it needed to be popular with the locals to survive in such a concealed location. And yes, it was good. An extremely fine and authentic Italian pizza came with the entertainment of flying pizza dough. A young Chinese girl opposite me got over excited and called out to receive a flying pizza. I am so grateful she was a good catcher - if 'good' means putting her hand and arm right through it - but that was good enough for a chap who was otherwise most definitely in the line of fire and not quite ready to receive a crown of dough. Roy Boy also took us on a little boat trip along the coast from the harbour. It gives a rewarding view of the place and how it is etched into the mountainside. So mountainous is this region there is not even adequate space for a proper graveyard. The custom hereabouts is to bury dead relative for three or four years in a provisional plot - a sort of earthbound equivalent of purgatory, maybe - and then transfer the remains to a mountainside tomb: really a slot in the side of the rock face. It saves space in a place where there isn't any to spare and, I imagine, gives people the chance of two funerals, which can't be bad by most standards, I suppose. (Achieving two funerals is, after all, the aim of those people paying a fortune for cryogenics!) From the sea you can see the residences - if there is someone to point them out - of stars such a Roger Moore (never known to have visited) and Italy's National Treasure Chest (Oops, Freudian slip): Sophia Loren. So narrow is the Amalfi Drive, and so devoid of parking space is Amalfi, that buses need to book a time-slot to visit, and during peak seasons a one-way system operates to prevent tour buses from returning towards Sorrento along the Amalfi Drive. (When I visited, in November, this did not apply and the Drive was enjoyed in both directions.) It is worth noting that not all tour companies pay to book a slot and, if they don't, you can expect an arduous walk down - and then back up - from a drop-off point well out of the centre of town. Not to be recommended! Worth checking out, even. This site really concentrates on accommodation and restaurants although the 'Highlights of the Zone' page is worth a visit.